I am somewhat puzzled as to how this differs from a book that is underrated, seeing as both involve a case where I value a book higher than an unspecified group of other people. However, since I have neither the time nor the desire, at the moment, to redefine the meme, I shall merely redefine that unspecified group of people. The following book is one that I read in my senior year of high school for an AP English class, and most of my fellow classmates expressed some degree of dislike for it; mostly for its interminable length, the plethora of nearly unpronounceable names, the exhausting and confusing monologues of a philosophical nature, the mostly bleak story peopled with unsavory characters, and the occasional bizarre dream sequence. It was hard to blame them – in fact, I fully expected to hate the book myself. But I didn’t. I was surprised, moved, and inspired. I really liked it. 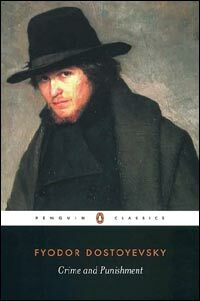 The book is Fyodor Dostoyevsky’s Crime and Punishment. It took drive and dedication to get to the end, but doggone it, I read every word of Dostoyevsky’s masterpiece. Try these names out on your tongue: Raskolnikov, Svidrigailov, Marmeladov, Porfiry Petrovich, Rodion Romanovich, Dmitry Prokofich, Pulkheria (Pukey???) Aleksandrovna, and Andrei Semyonovich Lebezyatnikov (called Lebezyatnikov for short). Say them five times fast. By themselves they are rather fun to play around with, but surrounded by dozens of other such names in the middle of 600+ page novel that moves at the dripping speed of molasses, and a reader can get dizzy trying to keep track of them all. Especially since Dostoyevsky likes to delve into each one’s life history and motivation. The story’s basic premise doesn’t help much. Troubled and destitute university student Raskolnikov messily murders the miserly old moneylender-lady, and spends the rest of the book tortured by his conscience and paranoid about being caught. Not exactly preferred summer reading. But what drew me in and won me over is how Dostoyevsky handles this. It helps to have a basic idea of the philosophical ideas in vogue when the book was published in 1866. Russian nihilism was threatening society’s moral fabric by its violent rejection of all authorities and its reduction of mankind to chemical components. Nietzsche hadn’t yet written Thus Spoke Zarathustra (1883) championing his idea of the Übermensch, but there already existed the idea of a “Napoleon complex”—that is, someone who believes themselves above the laws (legal and moral) of society because they are destined for greatness. Dostoyevsky wrote Crime and Punishment to deconstruct and demolish this repugnant idea, and he does it very well. Raskolnikov convinces himself that he is one of these “supermen” who need not obey the law and that if only he could get the money belonging to the local moneylender, he would be able to fund his philosophical writings and change the world for the better. To steal her money, he must murder her, and that he does, but only after a long period of getting up his nerve. But as soon as the blood is on his axe and two women are dead, guilt and fear overwhelm him and drive him to flee. The police struggle for many months to figure out who the murderer is, and even though they never gain evidence against him, Rasknolnikov is convinced it is but a matter of time. His nihilistic philosophies are no comfort against the bare fact of his evil action, especially since his nature is normally to be generous and loving. His destitute condition worsens. He grows deathly ill. His neighbors and friends puzzle over him, though all but a couple are too engrossed in their own problems to help him. Day and night Rasknolnikov is tortured mercilessly by his conscience, and in anguish and cowardice he fights it. For the most part, Dostoyevsky is not overtly religious, but his implications are clear to those with an eye. God does not abandon Rasknolnikov nor cause him to burn immediately. Rather, He provides two vital friends. Razhumikin, whose very name means “reason,” brings Rasknolnikov decency, common sense, and steady friendship. He does not suspect his good friend could be the murderer the police search for, but he tries his best to guide him away from paranoia and bitterness. The other friend is Sonya, the most innocent prostitute you will ever find in literature. Sonya sells her body only to keep her family from starving, but while Dostoyevsky clearly sympathizes with her, I don’t think he necessarily condones her decision. Sonya herself hates her profession, because she is a Christian. Is she hypocritical and wrong to be a prostitute, even though it is to save her family? Yes. It makes her wrong about that choice, but it does not preclude her from salvation. I think Dostoyevsky is perceptive in the way he treats her. Her faith in God’s ability to save everyone from sin, even herself and Rasknolnikov, is so great that she cannot help but share it. Even as she weeps for her own sin, she recognizes Christ’s love and transfers it to Rasknolnikov, whom she can see is clearly in need of it. She does not judge him, but cares for him. Eventually, she even begins to press on him the need for repentance. Naturally, Raskolnikov scorns the Bible stories she tells him, thinking himself a modern free-thinker who is beyond such spiritual ideas. But his conscience just will not let up. In the end it is too much. He is brought to his breaking point, and broken, and then, seeing Sonya before him, pleading, he turns himself in. It’s a remarkable little moment, but I’m glad Dostoyevsky doesn’t stop there. He provides us an all-important epilogue. Rasknolnikov is sent to prison in Siberia, where he spends years in quiet despair. Razhumikin visits him sometimes, but it is Sonya who actually moves to live nearby and visits him nearly every day. She no longer preaches—he knows the gospel message she has—she merely is constant, loving company. And slowly, very slowly, Rasknolnikov begins to soften. He himself had asked for it not long before he had fallen ill, and she [Sonya] had brought him her copy in silence. Until now, he had never opened it. The tide has turned. Exhausted and beaten by the broad path of destruction, he finally turns to the narrow little path that turns neither right nor left, and takes his first wobbly step down it. Dostoyevsky’s last words make gloriously, delicately clear that redemption has come. In the terms of another literary masterpiece, we leave Raskolnikov as he is heading towards the Wicket Gate that leads to the Celestial City. That is why I like Crime and Punishment. But you see how important it is to read unto the very last page.